We all know that scientists are in a constant search for alternative energy sources and this happens because in recent years conventional energy sources have started to decrease significantly. They have developed various systems that convert the energy from nature in electricity and many of these systems could be built at home, on a smaller scale, in order to reduce electricity consumption. After we saw how to produce electricity using magnets or wind power, it is time to talk about those people who live near a river. 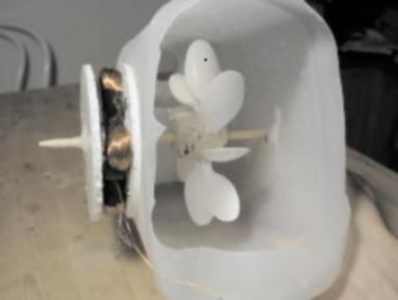 n this case, the best way to produce electricity is represented by a small-scale hydroelectric generator made at home. Often called as a low-impact hydro, micro-hydro or run-of-stream hydro generator, this system is not very hard to build. First you need some templates and a cardboard. The two templates that contain the rotor and stator scheme must be cut and attached to the front and back of the cardboard. After these templates are well glued to cardboard make a hole (1 cm) at the center of the stator disk. Now, you have to make 4 coils that will be attached on the cardboard. This requires you to use a cardboard with an oval section. Then, start winding the wires on this cardboard to form a tight coil (200 turns). Remove carefully the coil from the oval section and then, repeat this procedure to make three more coils. Arrange the coils on the cardboard according to the template scheme (their windings have to alternate between clockwise and counter clockwise). You must be sure that an electron would follow the path shown by the arrows in the template, begining from the left counterclockwise coil. Connect the ends of coils and use insulation tape to prevent any errors. Use a multi-meter to cehck electrical resistance (ohms). If the wires are properly connected the meter should produce a reading of about 10 ohms. At this stage you need 4 strong magnets to be attached on the stator template. Check the magnets, mark the south pole on two of them and the north pole of the remaining two. The magnets should be arranged on the template so that their polarity alternates (N-S-N-S). Then you need a cork and 8 plastic spoons. You have to shorten the spoons so that the handle will not measure more than 1cm. Look at the rotor template and insert the spoons into the cork (1cm depth). Make a 6mm hole through the cork (make sure the hole is centered), fix again the geometrical position of the spoons and add some hot glue to each spoon to secure it. Find a plastic tank or a bottle to attach the rotor, the stator and the small turbine. After you find the center of the tank, make a hole in that place (6mm) and fix the stator with its coils just above the hole. Then, attach on the same shaft the turbine and rotor (the spoons have to face the neck of the bottle and the magnets should be close to the coils (3mm between the coils and magnets)). It seems that our micro-hydro generator is almost ready to use. All we need now is a stream of water so that the turbine to spin continuously as long as there is water to drive it. If the turbine is properly connected to the generator this stream should produce enough electricity to power our utilities or charging batteries. Why Should You Build Your Own Power Generator?